Greetings! I would like to welcome everyone to the Art of Ninzuwu blog page. If this is your first time visiting us, please feel free to review some of our previous articles and share some of your insights by posting a comment. We wish you all the best in your spiritual endeavors. While there are many historical references that describe the Tengu in ancient Japanese mythology, when we are aware that such origins are linked to the Anzu birds of ancient Mesopotamia, we see a greater validity in how these jinn-like creatures create and structured the indigenous faiths of the world globally. This is a very important history that is not often discussed but useful for those, who exist on the path of Ninzuwu. We will discuss the development of these historical sciences in future posts. At this time, however, I want some personal experiences that occurred, which led to the decision of reopening the blog page. Upon achieving initiation into the Necronomicon Tradition, via the Gate-Walking Process described in the Simon Necronomicon, I was thrilled and overjoyed to be one of the few individuals having received such a rare initiation. I was eager to learn and develop in the understanding and application of how to get the most out of the Simon tome and apply it to my experience as a way of life. During this period of life, I was able to blog my experiences, meet others along the path, and even assist newly interested individuals in their understanding of this ancient tradition. Like so many of us, I tried to access the “ultimate power” of the text by use of maximizing and adjusting a lot of the formulas in the Simon Necronomicon, as if that in itself was the key to the transformation of the Self. Questions soon entered my mind afterwards. Is this path really complete” Where are the prayers and the mysticism of ancient Mesopotamia? After blogging so much about the Simon Necronomicon and ancient Mesopotamia, I came to the sad truth that reconstructing a tradition of this nature was going to be difficult. Ancient Mesopotamia has a very rich of fragmented history and a lot was destroyed in war and I also knew that some artifacts are withheld from the public. 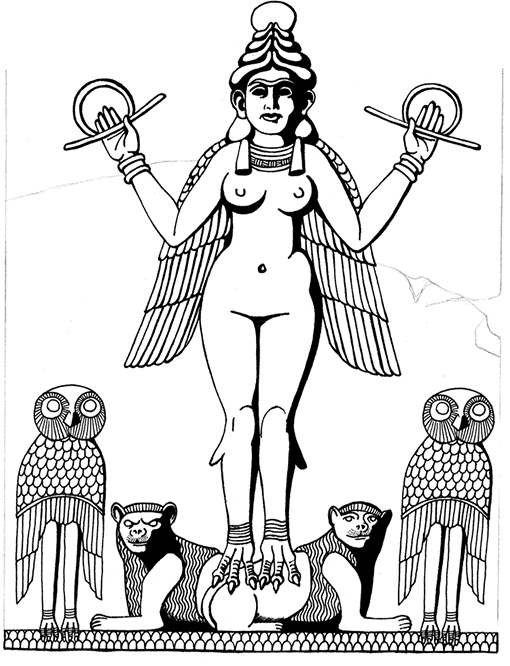 After entering the seven gates of initiation in the Simon Necronomicon, and walking the Tiamat Gate, years after, Grant’s words made me curious as to how the Kami were related to the ancient Mesopotamian goddess. At the time it seemed like the idea of learning Shinto was near impossible for a non-Japanese. However, after calling my Watcher I found myself in the office of a Sect Shinto group two weeks later. Interestingly, in this particular group’s history, they actually confirm Grant’s words cited earlier concerning Tiamat. In any case, my purpose in venturing out was in efforts to learn some principles from a primordial faith that I could in turn apply to the Necronomicon Tradition, since much of ancient Mesopotamia spiritual practices were either destroyed or hidden. I enjoyed learning about Shinto so much that I thought maybe to pursue such a culture fully and leave Mesopotamia alone. Shortly after coming to this decision, I came to realize that this was not the way either, at least not for me. One interesting thing about all of this that I must mention is that the Mesopotamian energies never left, even after closing the blog a few years ago. The last Gate that I walked in Simon Necronomicon ritual was a gate associated with the constellation of Pisces. Personally, the Walking of the Igigi, as mentioned in the Simon Necronomicon, I found to be the most blissful and informative practice in all of its workings and rituals listed. Despite whatever practices I performed I was still in the Igigi, which corresponded to Pisces, even after having left, what I thought to be the Necronomicon Tradition. Let me share with you a couple of examples. During the time of my Gate-Walking, I ran into relationship problems. This was a very stressful time for me, as I was upset that things were not working. So one evening I decided to ask the Watcher will I ever find the love for me. After having approached the Watcher in ritual, my deceased uncle came to me in dreams. This was my grandfather’s brother, and I only met him three times in my life. He told me that the next time I visited California that I would be married. After the recurring dreams, I wondered about taking a vacation to California, but my funds were low. Eventually, my girlfriend and I broke up and I met a new lady to whom I eventually married. When my wife and I got married, I had stopped practicing the workings in the Simon Necronomicon for about a year. I was still in the Igigi constellation sign of Pisces. I figured that since Pisces was the last sign of the twelve, it was the last step on the latter and a space that one should wait for celestial instructions. In any event, my wife and I decided to take our honeymoon later in the year. In turned out that we had to spend a night in Los Angeles. So we decided it would be great to see some of my cousins, many I never met before. It was a great time, though we only stayed for one evening it was the highlight of our trip. It wasn’t until a year later that I remembered the dream of my uncle. About two years later, at our family reunion, I asked my cousins, my uncle’s children, when was my uncle’s birthday. It turns out that he was a Pisces. How I met my wife was an even more amazing example of the Necronomicon’s strength. This incident occurred before I met my wife. After having broken up with my ex-girlfriend, which was actually told to me by a few fellow gate-walkers, I was devastated. I didn’t want to bother with Necronomicon for a little while. I decided to get reacquainted with the Shinto group I worked with before. I had left the group as I wasn’t into the “guru” thing or giving someone too much praise. That sort of thing maybe fine for some, but I believe that the mark of a good teacher would be to raise students who are greater than he, so that the tradition survives. This Shinto organization was very unique and I just need time and space to heal. One of my mentor’s in this group was a middle-aged Japanese women, who, like the others, spoke little English. She did, however, inform me that they could help my love life by means of some ritual or what have you. I thought it was a charming idea, but didn’t think of magic as a means of finding someone romantically. It just isn’t my way. One thing I did do however, was go to the river every day for 100 days to perform Shinto prayers. I was gaining in initiation. Charles, a friend of mine who attended the Shinto school also, gave me a ride home one night and we had a very deep conversation about jinn-human relations. He told me of his experiences of meeting an African priest, who arranged such things for a price that is way above the budget of the working man. This stayed in mind for quite. A month later, I just had to let my sorrow over the broken relationship go. I took out my Aga Mass Ssaratu, a bowl we use to light fire, and prayed and cried after opening up in ritual. It was then that I discussed what I would like in a woman. Ironically, prior to this, a few friends suggested that I needed to change my taste in woman and gave other additional counsel. I kept this in mind. Shortly after the ritual, I went to sleep. That night I had a dream of seeing my old guardian, whom I haven’t seen in years. The dream was intensely lucid and was quite comforting to say the least. Amazingly, as I was waking up from the dream, I realized that a woman was actually in bed with me! I lived next door to a church and the woman disappeared after the church bell rang for morning service. In the weeks that followed I received telepathic instructions on preserving my seed and how to perform, what is known as the Fahmu exercise. My wife came to me exactly how I was told and of course as a Pisces. These two examples reveal that while I was no longer committed to ritual, the energies still remained with me. In all actuality, even my sabbatical and exploration into Shinto, occurred at a specific time, which was around the same time that the “asaru” now Vasuh language of the jinn/tengu was beginning to appear. It was a time marked by Neptune’s entrance into the same constellation that I remained in, namely, Pisces. I now understand what occurred over the past few years. I had received knowledge of a very archaic tradition when in the realm of Pisces. This was coupled with several revelations from the tengu themselves. This is how the Art of Ninzuwu began. Over the next few months, we will be restructuring the blog page and editing out any typos and grammatical errors in articles prior to this one. We will gradually repost the information appearing on the Papers in the Attic blog page, on the Art of Ninzuwu blog page. One thing, however, is a bit different. While Papers in the Attic was devoted primarily to the workings found in the Simon Necronomicon, future articles will discuss ancient Mesopotamian spirituality in how it appears in The Oracle of Enheduanna. We will still present interviews and discuss information pertaining to ancient Mesopotamian spirituality.